RECENT MONTHS SAW A WELCOME UPSURGE IN THE NUMBER OF DANCE WORKS ON SHOW IN SYDNEY INCLUDING A CELEBRATION ON BANGARRA DANCE THEATRE’S 20 YEARS OVERLAPPING WITH THE SYDNEY OPERA HOUSE’S SPRING DANCE SEASON. HERE ARE SOME OF THE WORKS SIGHTED AND ENJOYED. Aptly, the engrossing traditional Yirrkala dances that opened the show were counterpointed at the end of the evening with a Torres Strait Islands-based work, including a fearsomely dramatic Saibai Island-inspired archery dance. 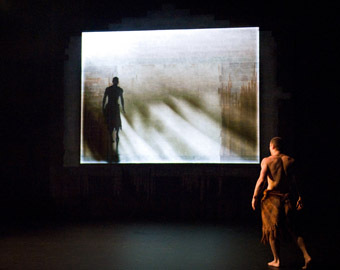 In between, the Brolga scene from Corroboree (2001) confirmed the brilliance of dancer Deborah Brown (dance solos are not often a feature of the company’s repertoire); Patrick Thaiday also excelled whenever he appeared, for example as West Wind in Frances Rings’ Unaipon (2004); and the Stephen Page-Bernadette Walong Ochres (1995) was a reminder of just how expertly the company has melded western contemporary dance with traditional Indigenous dance, and with surprisingly much more of the latter shaping each dance’s totality than I had recalled. The company’s social issues works fared less well in the celebratory context, their power only glimpsed and a certain datedness evident, although a dance with blankets was disturbingly memorable. What was never in doubt was a sense of continuity and often remarkable invention. Earlier, I had seen former Bangarra dancer Vicki Van Hout’s Pack, staged as part of the Sydney independent dance presenter Dirty Feet’s program, Tipping Point. In an intense work, four dancers, moving with bird-like alertness and the deep stepping of certain Aboriginal dance forms, map out their space territorially (with tape) and on each other’s bodies (with clothes pegs). Moments of intense, swiftly danced collectivity contrast with power plays and grooming displays—pegs removed gently from pinched flesh. This fascinating work, in which the tipping point seems to be whenever ‘enough is enough’ and the dividing tape is ripped up, fuses contemporary dance with Indigenous inflections to suggest that when it comes to territory we humans are pretty much just another animal. Dirtyfeet producers Anthea Doropoulos and Sarah Fiddaman put in excellent performances for Van Hout alongside fellow dancers Imogen Cranna and Verity Jacobsen. The Sydney Opera House Studio was the wrong venue for Japanese artist Hiroaki Umeda. The first of his two works, the 23-minute While going to a condition, places the performer centre-front of a pulsing video projection, requiring the audience to be, in turn, pretty much in front of him, with a clean depth of field, not either side of the stage. On the other hand, being too close can reduce the scale of Umeda’s relationship with the screen. A quick transfer to standing-room-only put me right, and I was soon enveloped in the mutual staccato of Umeda’s video, the mechanical rattle of the sound score and the performer’s minimalist body patternings. From initial stillness the turn of a foot becomes an almost shuffle-on-the-spot and then the bend of a knee prefigures a discombobulating body, always erect, vibrating, head down to the very end as huge lines, horizontal, then vertical multiply and flicker blindingly behind, and dissipate. He looks up. End. Against something huge, unnamed and noisy, the performer’s body seems fragile, the movements perhaps involuntary or compulsive-obsessive, although this might be the dancer’s idea of fun. Inspired by “the fluidity and jerkiness of butoh and hip hop”, Umeda seems to go “into a condition”, a state of being in the tradition of performance art where he partly places his work. 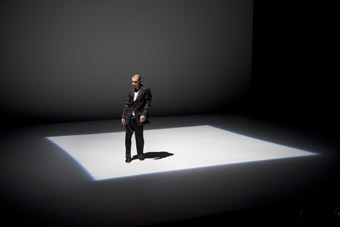 The second work, the 25-minute Accumulated Layout, is performed over a square of light cast from the right creating a shadow of the performer on our left. This time movement begins with the performer’s left hand until the light reverses to the left and the right hand moves. As the parallel sound world grows denser and more of the body is consumed by movement, from hand, to arm, to torso, it appears as if this time Umeda is responding directly to light changes and then to the sounds, again yielding a sense of keeping up but falling apart while continuing to function in a world of mixed signals. This is mesmerising, tightly framed work, limiting itself to a minimal movement vocabulary and visual effects in order to maximise a sense of entrapment, or is it transcendance? Is Umeda driven by something deep and visceral or by multiplying external forces? Australian Dance Theatre dancer Larissa McGowan’s Slack was the standout work in the otherwise uninspiring New Breed program in the Spring Dance season. McGowan is no Garry Stewart clone. Slack is an original work which opens with a strikingly surreal image—a man suspended by a length of plaited hair below a glaring fluoro tube. In turn he holds the plait and weight of a woman beside him. They appear to dangle and swing in an uncomfortable, possibly manipulative relationship. Eventually released from this suspension the woman must engage in an unpredictable world with an unpredictable body subject to imbalance, loss of control, the clutching incursion of others, until finally a new pattern, almost baroque, emerges, independent of suspension. The ensemble work is taut, disciplined and inventive and Jethro Woodward’s score and Lucilla Smith’s design reinforce the otherworldliness of McGowan’s vision. Meryl Tankard’s The Oracle is a very strange work, overburdened with symbolism and structurally awkward but blessed with co-choreographer Paul White’s committed performance, an act of considerable endurance, fitting for a work which evokes a saint’s fear of his body and his search for union with his god. The sacred dimension is establised with the playing of Joao Rodrigues Esteves’ Magnificat rising over the insect sounds of nature while images of the performer are projected like icons and multiplied in Rorschach doublings. The profane is heard in Stravinsky’s The Rite of Spring, but there are no pagan Young Girls to ritually tempt the solo dancer; his temptations are thoroughly interiorised. He rocks, he crawls, rippling like a serpent, dances with his huge blanket of a cloak, wrapping it around his head like a turban, flourishing it like a whip, swirling in it like a dervish. At times these images suggest desire, self-obsession, or futile attempts at transcendance. When he dances with a screen image of himself, delusion beckons. At other times he is suddenly afraid, as if having been seen by God. Finally a thin column of light flows from above, widening into a circle. He backs around the perimeter as if not knowing what to do with this ‘holy spirit.’ There appears, however, to be no transcendence, but increasing effort, lunges like siezures, jerks, astonishing hand stands like offerings, moments of abjection—he crawls like Blake’s Nebuchadnezzar. He dances to utter exhaustion. And we applaud him for it, and for the skill and passion with which this torment, this journey to being merely human, where every projected icon is of a false god, the self, has been so cruelly dramatised and endured.